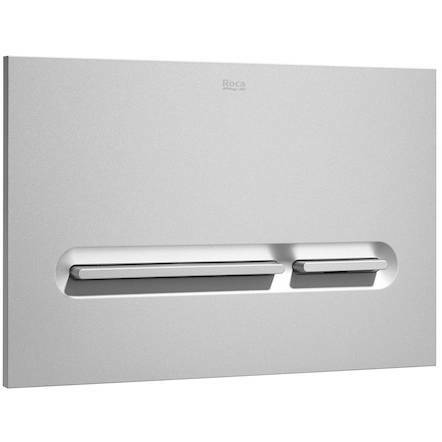 Roca Frames > Low Height Concealed Cistern & PL5 Dual Flush Panel (Grey). 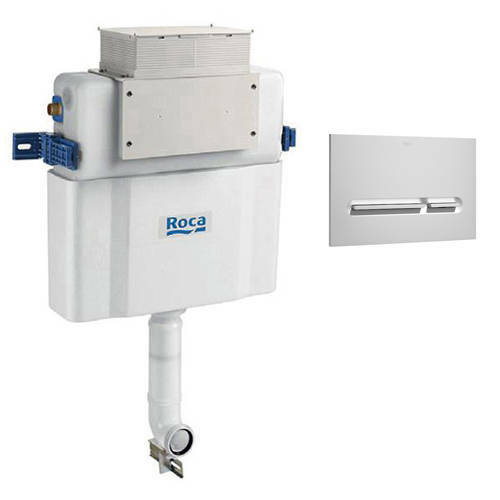 Roca In-Wall basic cistern tank pack. Low height with dual flush PL5 panel in grey and adjustable pipe (under window). For use with BTW toilet pans. The ideal solution for bathroom spaces with height restrictions. Compatible with back to wall toilet pans WCs (BTW, sold separately). Suitable for solid wall and stud installations. Suitable for public spaces and home installations (commercial and domestic). In wall design with dual flush cistern. 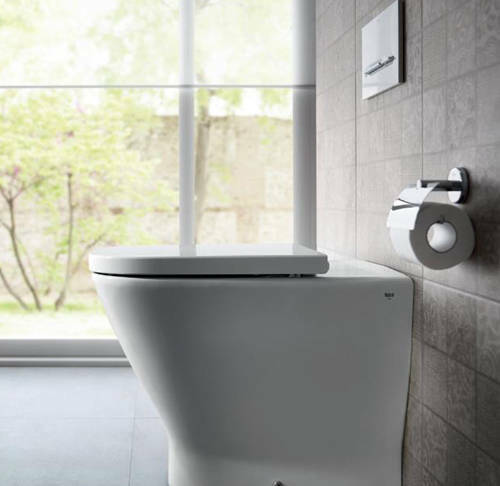 Operating panel can be installed in the front or the top of the cistern (flush plate). Easy installation and future maintenance. Flush valve longevity: 200,000 cycles. Insulated cistern for low noise levels when refilling and reduces condensation. Adjustable inlet pipe: 910mm to 980mm (70mm). Suitable working pressure: 0.1 to 10 bar (ideal for low or high pressure areas). Dual flush litre setting 1: 6/3. Dual flush litre setting 2: 4.5/3. Panel size: 250W x 10D x 160H mm. 2 Year guarantee: Roca guarantee this operating panel for 2 years. 5 Year guarantee: Roca guarantee this concealed cistern for 5 years. Roca are one of the largest manufacturers of commercial and domestic concealed toilet cisterns and frames in the world. This innovative idea saves space in bathrooms because it can be installed hidden in to the walls. These Roca frames are strong enough to hold up to 400kg which makes them a plumbers favourite choice. Roca began its activity as a company that made cast iron radiators for domestic heating at its factory in Gavà, near Barcelona. After these first radiators, the firm expanded its portfolio with the production of boilers. In 1929, Roca entered the bathroom space by starting the production of baths. Today, Roca's commercial plumbing network is spread over 135 countries supplied by its 76 production plants and more than 20.000 employees worldwide. The Roca Design Centre collaborates with the most prestigious architects and designers in the development of their Award winning bathroom products. With their wealth of experience they offer the highest quality plumbing products for your home.